*Tucker Carlson* defended *Donald Trump* from the "false outrage" of the last few days by saying the president was the victim of "extortion" from *Stormy Daniels* and *Karen McDougal*. 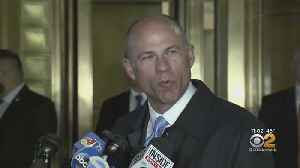 CBS2's Jessica Layton has the latest on the charges facing attorney and outspoken Trump critic Michael Avenatti, who police arrested for extortion and fraud. Donald Trump Jr. reacted to Tucker Carlson's response to the latest controversy.